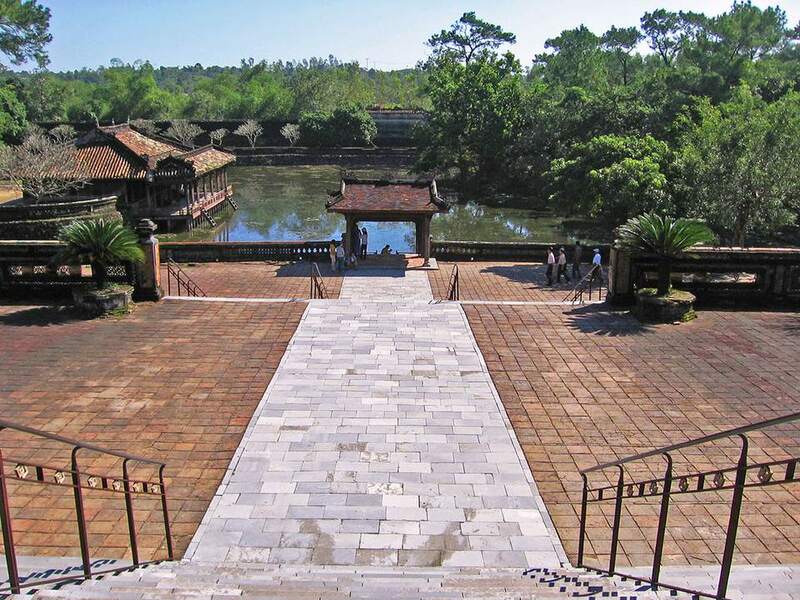 Visiting the Royal Tombs in Hue can be completed in one day, if you’re only seeing the three top tombs – a whole day should be set aside if you’re planning to see all seven tombs. Many tombs are set out of the way; to save time, visit the tombs as part of a package tour, or make arrangements with a friendly cyclo driver (there are plenty of them in the city proper) to take you to the tombs you want to see. The Vietnamese government charges an admission fee of VND 100,000 per visit for each of the Hue tombs (that’s about $4.50); the fee is generally not included in any package tour, and will be collected from each passenger (in the case of package tours) or paid at the gate. Established tour companies like Sinh Tourist are willing to take you through the Hue tourist scene in comfort; a typical tour package includes a trip to the Hue Citadel and the Thien Mu Pagoda along with a trip to the three most popular Hue tombs in the itinerary, ending with a scenic dragon boat ride down the Perfume River. Lunch is generally included in the package. A full day’s tour should include at most the Purple Forbidden City, three tombs, and the Thien Mu pagoda with a lunch break in between – tours with more stops included actually have less value for money, as you’ll only end up too tired and harassed to enjoy the trip. Cost: About $10-12 per head, not including admission to the tombs. Cyclo (rickshaw) and xe om (motorbike) drivers in Hue are among the most annoyingly persistent in Vietnam, but they do offer great value, getting you from tomb to tomb and sometimes offering half-accurate touring services. Renting a cyclo may set you back about VND 30,000 an hour (about $1.50 in US dollars), or about $8 for a single afternoon’s tour, waiting time included. Agree on your price before setting off on the trip and watch out for any negotiating tricks – ensure the amount negotiated covers the return trip, and make sure you’re negotiating in the right currency (“hundred” might mean anything between a hundred dollars and a hundred thousand dong – it pays to be specific!). Cost: About $12-14 for one whole afternoon’s tour. Metered taxis in Hue charge VND 15,000 flag-down rate and VND 11,500 per additional kilometer. If you’re planning to visit the Hue tombs, you can negotiate with most taxi drivers – just make sure you settle the price before you set out! Cost:About $70, for a whole-day tour (waiting time included). If you feel you can hack the chaotic motorbike traffic in Vietnam, you can hire a motorbike for about US$5 a day (or a bicycle for about US$1 a day) from many hotels down the main tourist stretch at Hung Vuong Street. Be prepared to hand over your passport while you have the vehicle in your possession.